Recent Notification: Jr. Clerk Hall Ticket Admit Card - Himachal Pradesh State Cooperative Bank Ltd Can Now Be Downloaded From www.hpscb.com . The Himachal Pradesh State Cooperative Bank in short HPSCB releases various job vacancies throughout the year.Recently, the bank released an advertisement of HPSCB Rect Of Junior Clerk for filling 156 vacancies of Junior Clerk in Bank.A huge number of candidates from Himachal Pradesh state applied for this clerk job vacancy.Last date for applying was 27th November 2015.New registrations for this post are now closed.Now the bank is going to upload HPSCB Jr Clerk Admit Card on its official website.Candidates can now download the admit card from the link given below. 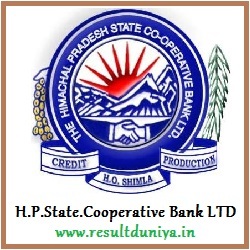 Himachal Pradesh State Co-operative Bank is a government authorized bank which time to time conducts recruitment for various bank posts.This year the bank is going to recruit 156 candidates for the post of Jr Clerk.The written examination will be held on 13th December 2015.Candidates who are preparing for this recruitment exam must download the HPSCB Jr. Clerk Hall Ticket in order to appear in examination hall. The final selection of candidates will be totally based on the performance of candidate in written examination.After the written exam, the bank will also conduct personal interview.Only those candidates who will be shortlisted by bank on the basis of performance will attend this interview program. All the candidates are requested to bookmark our website.If you have any problem regarding downloading or checking HP SCB Junior Clerk Admit Card 2015 then please contact our website admin or you can simply leave a comment below.